The cloud-shrouded mountain range, evergreen forests, and golden brush of this area of the Okanagan are all part of this bride's fondest childhood memories. Getting married at the private dock of her family's Okanagan lakefront estate meant she could enjoy the surrounding nature she loved so much. Having photos of her and her husband-to-be in the mountains around the house was important to her - so much so that the morning mist and drizzle didn't faze her one bit! Her only concern was getting her blue Manolo Blahnik heels muddy so she decided to go barefoot instead! We positioned the couple with the dark trees behind them for contrast and shot the image with the Canon TS-E 45mm tilt-shift lens to emphasize the other-worldly location and moody atmosphere. This wedding day portrait is one of our favorites as the couple's joyful expression and their interaction are entirely natural and unprompted. Plus who can resist a barefoot bride and groom? 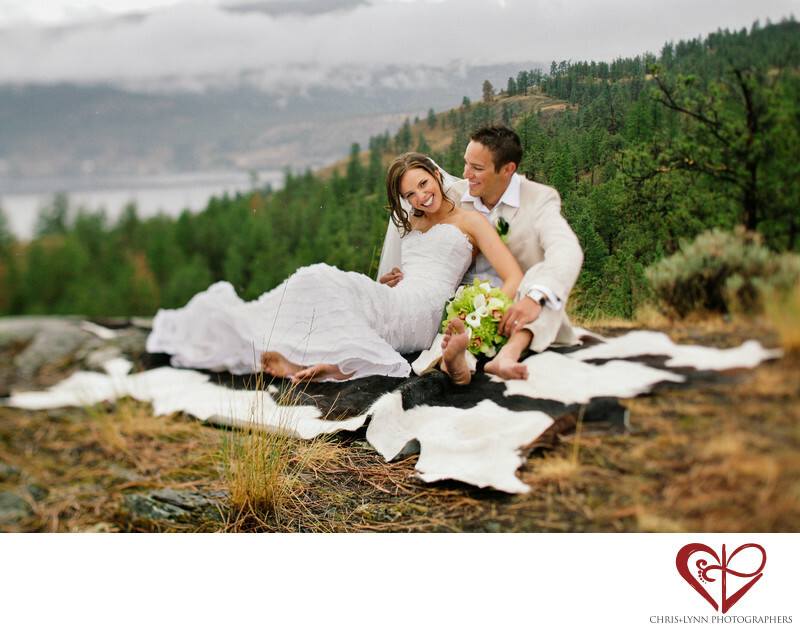 The Okanagan Valley is one of British Columbia's top destination wedding locations. Some our favorite Okanagan wedding venues include the Manteo Resort, Burrowing Owl Winery, Linden Gardens, Bonitas Winery, Black Hills Estate Winery, Walnut Beach resort, Sparkling Hill, Tinhorn Creek, Ex Nihilo, Cedarcreek Estate Winery, Predator Ridge resort, Summerhill Pyramid Winery, and the Naramata Inn. 1/1600; f/3.5; ISO 800; 45.0 mm.